In a review of an important recent exhibition in Nairobi, Kenya, Craig Halliday writes that ‘Sensing Nairobi’ (8-30 June, 2017) sought to capture, reflect and define Nairobi’s ambiguous urban landscape. How does one explore or present Kenya’s capital city of more than 3.5 million people? Given the metamorphosing nature of cities and how they become (re)defined by urban residents, who in turn are changed by the city, this is an ambitious endeavour; though one undertaken on by the British Institute in Eastern Africa (BIEA). Their approach brought together a group of artists, critical thinkers and scholars in an endeavour to ‘make sense’ of Nairobi through the city’s sensorial registers; a relevant method given that one’s lived experience of the city, the interplay between people and their surroundings, is formed through multiple sensory modalities with and to urban environments. The enquiry culminated in the exhibition ‘Sensing Nairobi’, held at the National Museum of Kenya in Nairobi, June 2017. This short blogpost reflects on a selection of works from ‘Sensing Nairobi’ in an exploration into the city. Entering the exhibition, the viewer was immersed in a body of work titled ‘Demolition’, an installation of re-claimed roof tiles, a short film documenting salvage and demolition industries, and diary extracts from workers in these businesses. 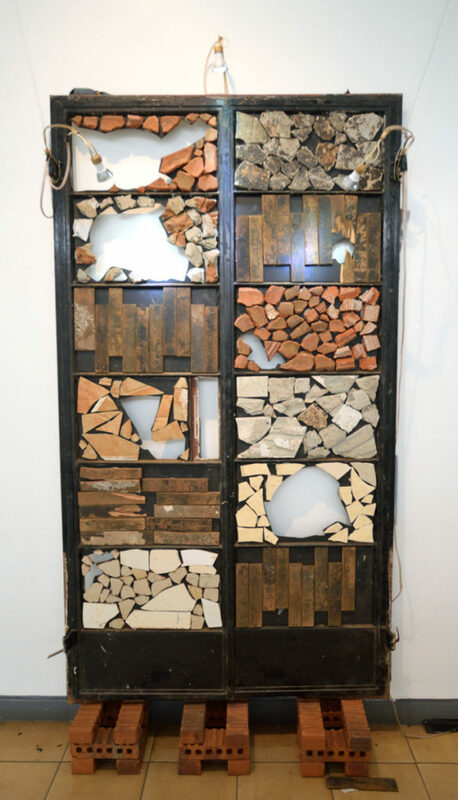 In addition, stand three sculptures by Meshack Oiro created from salvaged building materials. ‘Demolition’, a mixture of art and research, enquires how a city’s materiality affects people in different ways. The work prompts the viewer to contemplate the circulation and life of materials, their use and re-use, the built environment, acts of construction and destruction, the changing nature of physical space, and the different ways this alters perceptions and lived experiences of the city. Moving through the exhibition hall you came to a small room containing the installation ‘Akili ni Nywele’ by Wambui Kamiru Collymore. 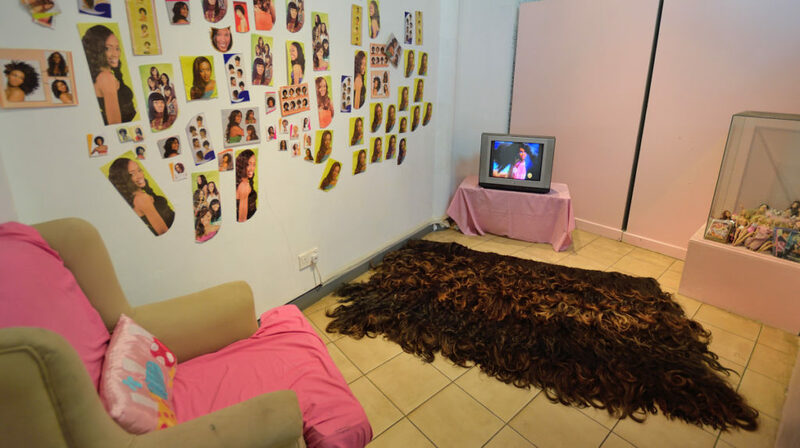 Hair advertisements cover the wall and a television plays commercials marketing hair extensions as “the hair you deserve” which will instantly attract desirable men to you. The artist states that the use of hair extensions is “sign of success in urban areas” and is “a lifestyle choice for the modern Nairobi woman.” Though why is this? One explanation is the impact of urban social pressures, starting from childhood; something the artist references through the use of play dolls for young girls which perpetuate narrow beauty standards, furthered through the role of corporations and their marketing techniques. The visual narrative of Nairobi is also explored in ‘ManPower’ by Neo Musangi. The work uses posters (frequently pasted across the city) offering to solve problems people face. These ‘services’ are advertised by intriguingly named Doctors, Herbalists, Professors and Astrologers – though their contact details are often the same. Like these posters, encountered through ones’ daily navigation of the city, ‘ManPower’ comments on visual narratives presented across the city and one challenges or passively accepts concepts of ambiguity, authenticity, what is real or fake? In a darkened corner, is the installation ‘Nightmare Chamber of The Powers That Be’ – created by Ralf Rafee. The work is a reaction to ‘City Cotton’ – an informal settlement destroyed by an armed gang, overseen by Kenyan Police. Approximately 100 photos depict City Cotton’s annihilation and eviction of residents. Strobe lights cause a degree of discomfort. As you enter this space the role of spectator shifts to participant. You are forced to push through the photographs. An act causing some to fall. Do you try and hang them back or choose to ignore them and push on? 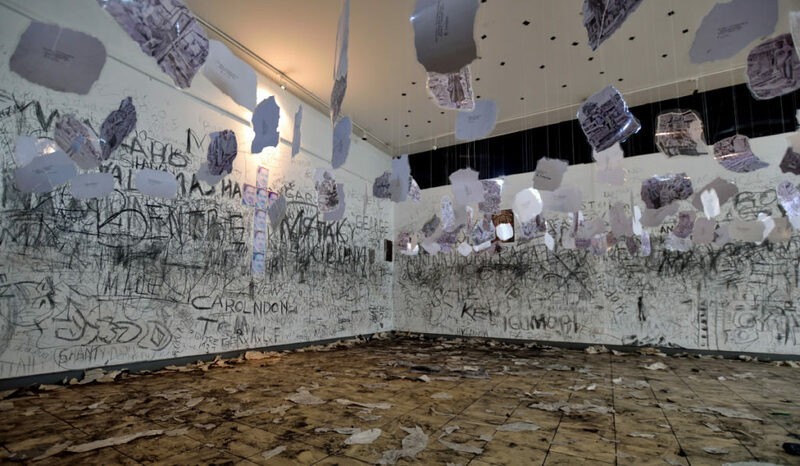 Visitors have covered the walls with their chosen text, imagery and marks; using chunks of charcoal that litter the floor. This performance can be seen as claiming a space, creating something new by leaving a mark or destroying something previously left. The space, like the city, is in a continual state of change and remaking. The work questions how urban space is not a ‘given’ but is rather created by the people who live in it. 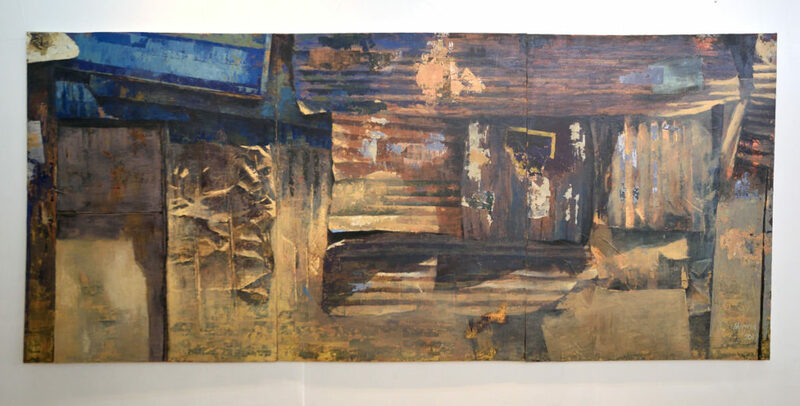 The relation between people, environment and the marks left through this contact are also explored in the multi-layered paintings titled ‘Foot Prints’, by Elias Mung’ora. Though like the people from City Cotton, whose images hang by a thread, many of Nairobi’s resident’s experience of the city is one of risk and instability. There is a vulnerability to city life, one that is advanced by mass inequalities and disparate power relations. But if the city is created by those who live in it, then we all play a part in what it is and becomes. ‘Nightmare Chamber of The Powers That Be’ asks us to confront this discomforting reality; what we choose to see, who we ignore, what traces we leave and whose narratives are remembered. A series of photographs and audio installation by James Muriuki visually presents Nairobi’s physical and spatial forms, through the substance of water – which relates to Nairobi’s historical formation. Established in 1899, Nairobi – whose name translates as a “place of cool waters” – was a lush green wetland with clear rivers. Muriuki’s series of photographs portray water scooped from different points of Nairobi River (some visibly polluted more so than others). A recording taken from these sites plays in the background. Similar to the river, Nairobi’s residents flow through the city; though like the unequal sites of pollution presented in this work Nairobi’s historical policies of segregation (racial and socio-economic) are also highlighted and it is these which continue to impact and shape city’s multiplicity of disparate spaces. By navigating the exhibition (which includes work in the form of video, installation, photography, painting and sculpture – created by over fifteen contributors) you navigate Nairobi, or rather the pluralities of Nairobi; from everyday interactions with the city and its spaces, perceptions of beauty, colonial legacies, patterns of spatial use, ritual, power relations and the city’s materiality. Sensing Nairobi provides a unique range of insights into urban life through multi-sensual experiences of the city, and in doing this it widens our perception, enriching our registers of experience and understanding of Nairobi. Craig Halliday is researching for a PhD in the role of visual art in Kenya’s democratisation. Prior to this Craig completed a MA in African Studies, MSc in International Development and has worked and lived in Kenya, Malawi, Sierra Leone, Tanzania and Zambia.